“Adapt or die,” is how we hear statistical mastermind Billy Bean -- played by Brad Pitt in “Moneyball” -- describe the application of analytics to baseball, and it is time HR managers heard the same thing. Here are just three of the many ways HR managers and leads can turn to baseball-inspired predictive analytics to improve their efforts and break existing talent biases. WAR is essentially a numerical representation of how valuable a player is -- based on a review of nearly every available stat -- relative to a below-average replacement from the minors. By analyzing past successes in individual hiring and hiring events, HR can optimize placement relative to job responses. Firms can generate high-quality responses by precisely targeting posting locations and determining what characteristics -- such as current certifications, title or employment duration – must be listed as requirements. A deep dive into existing HR data often provides a clear look at past time-to-fill and fill ratios. Predictive modeling here can help HR managers reduce overall search time and improve candidate ranking. That means the right talent is found, matched to the proper position and offers are made sooner and more afford-ably. Predictive analytics can optimize any talent management team by helping them -- as Peter Grant would say -- stop buying players, and start buying wins. The best way to keep your statistical playbook up-to-date is to keep learning from the best in the industry, like the analytics heads for the giants of baseball, the Texas Rangers. Join them and other Rangers executives for a thought-provoking discussion on where analytics performs best and what is needed to help it thrive at BPI's annual Conference. Many corporations are not satisfied with their high potential leadership development programs. The problem for some organizations is that their approach is too linear and programmatic. You can’t make leaders the same way you make sausage. A company should not define “high potentials” too rigidly. Managers know at a gut level who many of their high potentials are, including ones who may not fit the mold. Developing high potentials should be a stand-alone program, not part of the mainstream leadership program. The C-suite needs special leaders, and prospects for the C-suite should be identified and trained differently. A high potential today should be a high potential tomorrow. If a high potential was correctly identified but is not advancing, the problem is in the development process. The high potential training process should not undermine the motivation and productivity of the rest of your workforce. If your high potential program for 3% of your workers is counterproductive to the motivation of your other 97%, that's not smart talent management. Developing high potentials requires more than checklists and timelines. It is about cultivating the exceptional talent of unique individuals. Those high potentials need unique and custom-made development plans. For more articles like this visit Best Practice Institute's Leadership and Management blog. Use skillrater, our anytime 360-degree feedback tool: www.skillrater.com and develop your high-potential leaders in an open and transparent manner backed by a researched methodology in feed-forward, anytime feedback. As a Human Resources executive, you already know how important a technical competency model can be to your organization. For those who are in the process of developing a technical competency model, and already have an existing centralized talent management system, this article will give you some great tips to help when implementing your model. What can an effective technical competency model do for you? Improve the organization’s bottom line. It is essential to be able to successfully designed, developed and implemented a technical competency model. Some of the most important elements are that these models are at the center of a successful Human Resources Department. These elements include being able to understand the specific knowledge, skills and abilities (KSA’s) that are most needed in a specific position. Recruiting should be looked at as a type of art form and people outside the Human Resources field don’t understand the importance of this. Analyze the different HR processes to see which ones need improvement such as recruiting, performance reviews or disciplinary procedures. It is helpful for the company to consider implementing a main competency model and then adding on to that. Take the time to set the criteria for the model based on what the organization needs. Don’t forget to consider the overall strategy of the entire company as well as identifying the key positions. All of the other positions should be built around this. Once all of the jobs are identified, it is essential to define the measures of performance for each job. Think about who the key users will be and build the model around that. Decide how much data collection needs to be done in order to have a successful model. It is critical to know what you want in a clear plan in order to achieve success. Technical competency modeling is an innovative way to improve strategic management decisions. Planning and implanting technical competency models has sharply increased over the past few years. Organizations all across the nation are seeing that it has become a necessary part of strategic planning. One such company is Devereux Cleo Wallace, a health care organization located in Colorado. Turnover became so bad that it had a rate of 60 percent. The Human Resources Department had been doing an excellent job of recruiting and hiring some of the best candidates who had the right experience and education for the job; however, that wasn’t enough. The company designed and implemented a competency-based candidate selection process and the turnover rate quickly fell between 15 percent and 20 percent. This is an excellent example of how important this process is for any organization, and competency-based interviewing is one of the most frequently used interview styles used in companies all across the U.S. There are many Fortune 500 companies who are designing and implementing these policies with excellent results. Some of these companies include AT&T, PepsiCo, General Electric, KPMG and American Express, just to name a few. In fact, AT&T had a major transformation recently in its HR Department. When the company had to go through many hard transitions in the late ‘90s, they lost many employees and had a very high turnover. After much analysis, the company found that they were able to make positive changes that ended up having a great change. They also found that they were able to locate the right candidates by looking for those who are good with people and are also competitive and high performing. A recent study by Towers Watson revealed that competency models are vital to an organization’s culture, and this particular competency framework assists with attracting the top candidates and retaining the talent who has already been hired. Once the appropriate analysis has been made for your organization, it will give you a better idea of what would work best. Designing and implementing a competency model for any organization will bring about a positive change that will in turn help the overall strategic planning. Businesses are constantly changing structure and policies because technology also changes and becomes more and more pervasive in the workforce. Social media, something that managers encouraged employees to watch out for and avoid posting on, is now a driving source for employees as brand ambassadors. Everyone from entry level workers to managers are encouraged to post company news and accomplishments on their own social media accounts. According to a Forbes article from earlier this year, over 57% of employees value their employers sophistication and use of technology. The change in how the work place interacts with tech and utilizes it for productivity has made it so that businesses have not only considered using the likes of Facebook and Twitter, but HR apps as well. Many people already rely on mobile applications for accessing a car service, paying bills, checking their bank accounts, and even ordering food. Having cloud systems and applications that conglomerate many aspects of an HR department is here now. TargetRecruit- A recruiting app that is designed to facilitate various firms with a large range of tasks including sales, accounting, social media, and sales. Features include allowing recruiters to easily organize information from potential employees and set up interviews as well. The app also enables timesheet organization and filing, and even setting up a payroll. Talent Rover- Another application that uses a straightforward approach to managing tracking software and simple interfaces. The app also allows for email and phone integration, a resume manager and job boards, organizing expense reports, and online chatting. Litmos- This is more of a training management app that allows employees to access learning materials at any time and anywhere. Litmos also lets companies get ahold of partners and certify contractors easily and quickly. A lot of leading brands and companies currently use Litmos including YouTube, Exact Target, Zumba, and build.com. Box- Though this is not a recruiting app for HR, it allows for easier collaboration and information sharing in the workplace. It allows for file sharing and editing, managing community commenting, and assigning tasks. It’s used by major brands like P&G and GAP and has gotten rave reviews from publications like INC and Fast Company for its ease in usability. 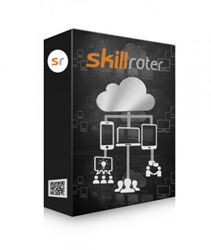 Skillrater – an anytime 360-degree feedback tool that is designed to formulate social circles within organizations that enable real-time advice for actual work activity. It is based on an appreciative framework for feedback in the form of advice that takes the sting out of traditional performance reviews and is based on real events rather than generalizations about the employee’s performance. Regardless of what industry a company encompasses, communication and efficiency are always going to be important, especially when meeting the needs of customers and employees alike. Apps have the potential to make management easier, increasingly organized, and more efficient. Expect to see a growth in HR related apps throughout the rest of 2015 and into 2016.